I swear by Allaah -based on my observations of their actions, statements and stances-that these people desire falsehood and to divert the youth from the scholars. 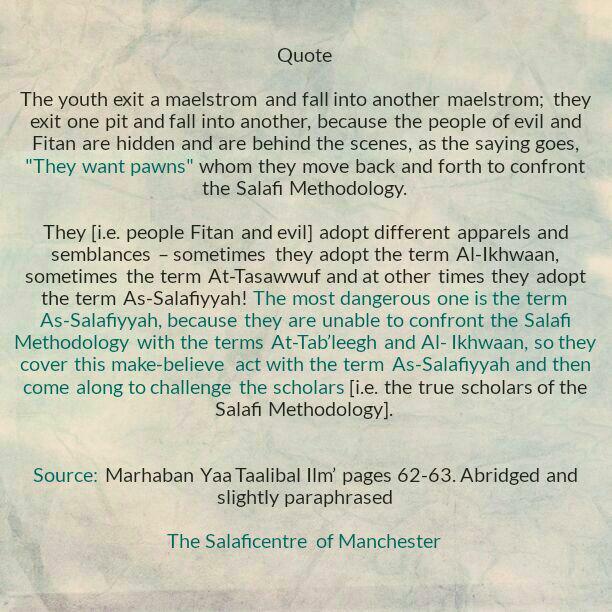 The youth exit a maelstrom and fall into another maelstrom; they exit one pit and fall into another, because the people of evil and Fitan are hidden and are behind the scenes, as the saying goes, ” they want pawns” whom they move back and forth to confront the Salafi Methodology. Where did Ikhwaan al Muslimoon and the Qutubiyyoon [ref1] get these ideas from in this land [i.e. Saudi Arabia]? Where did the ideas of Juhaymaan, Abdur Rahmaan Abdul Khaaliq, Al- Haddaad, Al-Maghraawi and Abul Hasan Al-Maribi come from? [Ref 2] All of them are tail ends of Ikhwaan Al-Muslimeen’s ideas. All of them- beginning with the Fitna of Juhaymaan up to date- are tail ends of Ikhwaan Al-Muslimeen’s Fitna, whose main setup is to topple the scholars. However, they adopt different apparels and semblances – sometimes they adopt the term Al-Ikhwaan, sometimes the term At-Tasawwuf and at other times they adopt the term As-Salafiyyah! The most dangerous one is the term As-Salafiyyah, because they are unable to confront the Salafi Methodology with the terms At-Tab’leegh and Al- Ikhwaan, so they cover this make-believe act with the term As-Salafiyyah and then come along to challenge the scholars [i.e. the true scholars of the Salafi Methodology].